The Seattle news media has been busy lately speculating on the Mariners acquisition of Daisuke Matsuzaka in the off season. 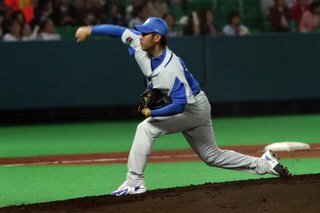 Blurbs in the newspapers, from Seattle's MLB.com writer, and translations of the both have included the Mariners in the race for the ace righty's services. It's natual given the influence of board member Minoru Arakawa, who basically created Nintendo America, Donkey Kong, and the NES systems. He is the son-in-law of former Nintendo Chairman and Mariners owner Hiroshi Yamauchi. The Mariners have been in the hunt for Japanese talent after pioneering the acquisition of everyday players with the signing of Ichiro Suzuki. This short note from Rotowire is a nice short summary of the news, and includes mention of the money involved in the posting, and perspective on the high pitch counts. 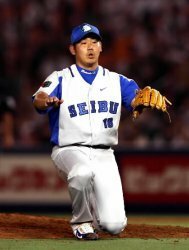 $30 million dollars seems to be a popular figure bandied about in the discussions of Seibu negotiations, which seems outlandish, but they are in a seller's market after all. If you take that figure into consideration, and factor in the estimate of $10 million a year over 4 or 5 years, the amount of money teams will need to spend on Matsuzaka is roughly $16-$17 million per season. Ouch. That kind of money is reserved for the Mussinas, Clemenses, Randy Johnsons, Andy Pettittes, Pedro Martinezes, and Curt Schillings of the world. Even those guys are somewhat overpaid at that figure. The base salary of $10 million a season would put DM in the company of Derek Lowe, Jose Contreras, Ben Sheets, Matt Clement, Eric Milton, Jason Schmidt, and Tom Glavine among 2006 base salaries. As good as he is, and as much as I believe he'll earn that kind of money as a frontline starter for the next 7, 8, 9 years, it all but eliminates most of the Major League clubs. 19 teams have a starter making $8 million or more. 13 teams have a $9 million+ starter. 10 teams have a guy making more than $10 million for a single season. Those teams are the Giants (Schmidt), the Mets (Glavine, Pedro), the Braves (Smoltz, Hampton), the Astros (Oswalt, Pettitte, Clemens), the Cubs (Wood), the White Sox (Vasquez), the Blue Jays (Halladay), the Red Sox (Schilling), the Padres (Chan Ho Park!! ), and the Yankees (Johnson, Mussina). What you see there is a combination of big market teams, with both New York and Chicago franchises on the list, a couple of mid-market teams with owners who wisely spend on pitching in the Red Sox, Astros, and Braves, ace pitchers on floundering middle of the road teams (Halladay and Schmidt), and an awful contract in San Diego. Chan Ho Park is the 5th highest paid pitcher in the Majors this year at $15.3 million!!! The Mariners would seem to have a nice amount of wiggle room in their payroll (currently ranked 11th at a little over $87 million) with Jamie Moyer, Joel Pineiro, and Gil Meche's contracts expiring after this season. I'm not up on the latest Mariners' contract discussions, but you'd have to figure that they are ready to say goodbye to Moyer. You'd have to figure that they will keep one of either Pineiro or Meche, who will both turn 28 in September. Both seems silly, given their mediocre performances, but you never know. There will be a lot of freed up money to splash on Matsuzaka if the Mariners are serious. With Ichiro and Johjima in the fold it makes sense. It almost seems like they had this plan a year ago when they brought in a catcher who speaks Japanese, huh? The Yankees, for their part, would seem to have more flexibility than it would appear at first glance. Beyond deep pockets, the Yankees have some moves they can make to actually lower payroll and still add Daisuke. If you're interested, you can see the expanded Yankees version of this post at the mothership, Canyon of Heroes. In the end, the "posting money" you gave to Seibu can be offset by Japanese marketing. You'll draw even more television interest, tourism, jersey sales, memorabilia, and ad sales to Japanese companies. The base salary that Matsuzaka will earn, actually becomes a bargain if he performs like an ace. Smart business. Seattle already knows it with Ichiro, and the Yankees definitely know it with Matsui. 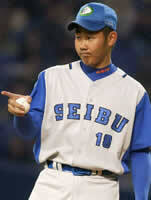 Unlike Ichiro and Matsui, Matsuzaka will only pitch every 5th day. It hardly matters, however, as the interest in those games he starts will be huge. He is called "the Crown Jewel of Japanese Baseball" after all. The Mariners and the Yankees are the wisest choices for everyone involved. With everyday Japanese players in their lineups , and large Japanese populations, New York and Seattle will reap the benefits of additional exposure in Japan. Without the everyday player the TV coverage is limited to a once a week appearance. Seibu figures to make money from the marketing of Matsuzaka as one of their own in the Major Leagues, Japanese advertisers would benefit from the everyday tv exposure that their brand would get, and Matsuzaka himself would have a comrade to consult on the peculiarities of life in the US. That's not to say that the Angels, Dodgers, Red Sox, Mets, or other high payroll clubs wouldn't love to get in on the action. I'll examine those teams a bit more closely as we get closer to the close of the season. How would paying Seibu and signing Matsuzaka affect those teams' fortunes? For now, it seems the Mariners and Yanks are off to the races.